I assumed Julio Santana was unavailable because he worked yesterday. I wonder why he wasn't brought in rather than Davis? I also assume Capellan is being held back from consecutive games due to his youth and potential. I admire Ned for not using Turnbow for more than an inning. At this point, he's simply too valuable to risk losing due to injury right now. Many would manage these games like they are the playoffs, and they simply are not. At this point, I'd rather have my spleen removed while wide awake than watch Dana Eveland throw pitch after pitch outside the strike zone. I know he's young, but seeing him completely fall apart of late is just unacceptable. As I mention, guys like Glover and Lehr get ripped on relentlessly, but overall pitch fine, and Eveland escapes all criticism. 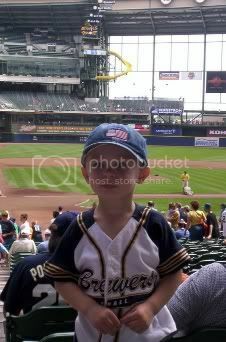 This is our 3rd or 4th attempt at putting up pictures from our Miller Park visit in August, and the first time it has worked. Enjoy. 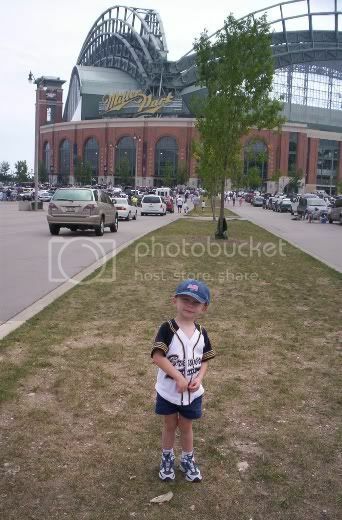 This is my son Andrew, as we prepare to enter Miller Park in late August. He kept asking why there was a bridge on top of the stadium. Andrew kept telling us he wanted to sit "up close", obviously not knowing what his daddy does for a living. But, as we walked down toward the field, he plopped himself down, as Bob Uecker would say, in the front row. 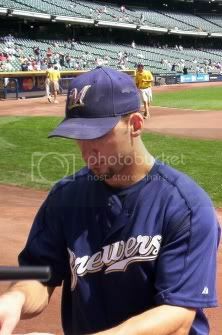 When we were there, it was Brady Clark's last day on the DL, so he spent about 10 minutes signing autographs. Andrew didn't seem to understand that he was a player, and kept asking questions about what the grounds crew was doing, and was especially fascinated by the small tractors. Every once in a while, Andrew will ask during a game, "Which one is Brady Clark? ", so I guess he recalls it. Another pic of Andrew before the game, with the field as a background. We realized we didn't have a Brewers' cap for Andrew, so we got him one at the Fan Zone for the bargain price of one month's labor in Bangledesh. Midway through the game, we went up and ate at one of the tables on the concourse area for about an inning, and Andrew promptly took it off and left it on the table. Luckily, we noticed it was missing right away and it was still sitting where we had ate. 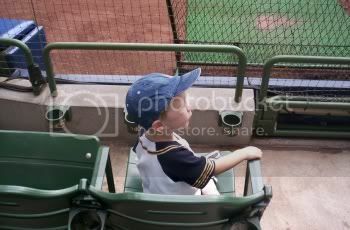 Also, notice how roomy the seats at Miller Park are when you are his size. Thanks for mentioning the Jim Cramer show, I usually watch it and really enjoy it. Curious if you saw him give the thumbs up to Wal Mart? I just happened to catch Jim discuss Wal Mart, or most of it, as my wife was flipping channels. It was hardly a ringing endorsement (kind of a "that's not as bad as usual"), but I found it interesting he said the exact same thing I did when I bought it (of course, at a much higher price than it is now): Wal Mart is simply too cheap not to own. He also put forth this little nugget...Wal Mart costs less now than it did 6 years ago. Wow. Considering its monumental growth, both in the US and abroad, that alone makes it almost mandatory to own. My post a few down about milk subsidies brought one interesting response, and a link I will share, about Kraft "rigging" prices by flooding the futures market (the CME) with surplus cheese. I have no idea if this is the truth or not, or as I tend to see it, a biased version of the truth. Also, if it true, I'm not sure if it would be illegal or not (unethical yes, but...). I find it difficult to believe, but stranger things have happened, I guess. in the offseason. Now, it goes without saying most fans would give a rat's behind about this development, but you could say the same thing about the day the Crew drafted Ben Sheets, Rickie Weeks, and Prince Fielder...all taken in the 1st round, by the way. I am on record as saying I would not give up a 1st round pick unless I'm a very serious contender, but in Milwaukee's case, they are rarely even considered by a "premier" free agent. Damian Miller was last year, but he was from Wisconsin, so he was special. But, so is Washburn. Another name often mentioned is Kevin Millwood, because Yost used to be on the coaching staff in ATL, when Kevin was a Brave. That seems like a weak connection...at best, as Millwood probably has a similiar, fleeting very unconvincing association with half the MLB teams. While I would feel terrible giving up a 1st rounder, as it is exactly how the Crew has built themselves, the odds of another WI player coming along is slight, especially in the next couple years. I'd make an exception to the rule, if it would come down to it. 1. Prematurely celebrating a .500 finish. This team, as all mediocre teams, could easily lose three in a row. 2. Upset the team "only" drew 28K or so on the free day. While I personally wish they would have had 40K+, realistically, that was unlikely. Maybe the team shouldn't have let people get 8 tiks each, though I thought it was a polite thing to do, considering families with 5+ often get the short end of the stick. To be blunt, the team cost themselves about $40K by not selling tickets after last Thursday (2K tiks x $20). They gained that in publicity and goodwill, and maybe even by the extra concessions and merch they sold. It was a brilliant move, in a series of brilliant moves. (9/30/2005 08:14:00 AM) - Robert R.
There probably isn't going to be much in the way for awards drama for the Brewers this year. That said, the Brewers PR department would be well advised to advertise J. J. Hardy's second half and his September which should put him in line for Rookie of the Month honors with a .312/.360/.584 (.945 OPS) September line with 5 HRs and 19 RBIs. It's simply a terrific month for a SS and really gives some optmism for next year. I do give them credit for, a month later, correcting their errors, but let's remember...these guys are reporters, not rumor starters, gossipers, or so on. They are paid extremely large salaries to report the news and events, not distort and spread false "facts". Where were the fact checkers? Does CNN even bother to employ any? Many spoke of the hundreds of dead bodies in the Superdome, stepping over many...and it was nothing but exaggeration and lies. No one bothered to check with the Dome and sigh, ask? And, seriously now, do people actually watch CNN and expect to get anything resembling the unbiased truth? C'mon. As I've said before, I'm the first to admit Fox News slants to the right. The ironic thing is, some folks still deny CNN (and every other news organization) slants left. Goodness, the fact Fox draws more than the other cable news networks...combined, would seem to answer that all by itself. The St. Paul Saints left the Northern League and plan to join with some teams in Texas in a new league. This strikes me as just plain odd, but the only thing that comes to mind is the new league hopes to be more at the AA/AAA level, with veteran players looking to jump to the majors. With the teams so spread out, it means planes instead of buses, for the most part. That tells me they may be trying to get the absolute best players available. I've long suggested a 4-6 team indy league made up of all players who are not on 40 man rosters, over a certain age of "prospectness", say 25. One example would be Kevin Orie, veteran 1B/3B who played for Nashville, then asked for his release to have a better chance at catching on with a big league team. Another example would be the Brewers having to call up a C when Damian Miller was banged up, and having to go with a weak AAA guy, because they didn't have anyone deserving of a promotion. In that case, the Crew could have looked up who was playing the best at the time and had him in MIL the next day. They could make it so the team would have to guarantee the player a "fair" salary (say, 15 days of ML time would be just over $25K, and pay that even if the player stays only 5 days), and then send the league some money as well. I doubt that's what the plan is, but I guess we can hope. On the Brewers' own site, this link has the news of a soon to be Doug Melvin extension, along with Mark A discussing payroll and an alternate uniform for '06. Mark A has been hinting at this for a while, and it sounds like it will get done. Doug Melvin's tenure as the GM has been barely short of genius. Well deserved, to say the least. Last week I had one person write to say I was nuts to think that Gary Glover would be a top minor league free agent this offseason. I believe his exact words were, "Gary Glover will never be a top anything." Yes, he will. He may have a career 5ish ERA, and probably isn't a bit better now. That said, that turns into a 4.50 ERa in the NL, and he gave the Brewers 6+ innings most of the time. What's funny is, many fans look down on Glover, and think that he's not good enough now that the Brewers are better...yet don't even notice Glover is darn near Cy Young compared Yankees' rotation memeber Aaron Small. David from the Oklahoma City area writes to tell me that the owner of the Hornets said he expects to sell out every game they play in OKC in 2005-6. Again, if this is an unannounced permanent move, more power to the NBA. A reader points out that Nelson Cruz is 25, not 26 as I said last night. Nelson isn't a terrible prospect, mind you, I just think he's much less of one than Corey Hart, who outperformed him and is a couple years younger. Mississippi seems to be a bit split on the inland casino debate. Considering the only other thing they are known for is illiteracy, I think they should embrace the gambling scene with open arms. The idea casinos are going to build new buildings in an area called Hurricane Alley...on the water, seems like they think there's a sucker born every minute. Right now, if my life depended on it, I'd rather have Jose Capellan going for me than Turnbow. Perhaps Derrick is just a bit fatigued, but Jose seems to have much more velocity and pop on his fastball. It'll be interesting to see who Ned uses tomorrow night in the 7th inning on, if the Crew leads. No one is really fresh, and no one has been outstanding of late. I do find it kind of funny DLR has been up each of the last two nights, he must be the "if the first and second choice get lit up and we're down by 3" guy. Daron & Bill are several steps slow, as they are unaware that tonight is the final Amoco free ticket night, which led to a crowd twice as big as last night. The price of the ticket is $1, so it does count, though I'm not sure if BP Amoco pays that or if it is some sort of "tradeoff" for the countless mentions. Someone wrote a couple days ago how the Crew will count the crowd on Thursday, when they gave away remaining tickets. I assume the official attendance will be about 12-15K, as those season ticket holders and others who had tiks will be given ticket vouchers for a game next April. I would guess they'll announce the crowd at the park as butts in the seats, with tickets sold in the boxscore. We will see, I guess. With Bill Hall currently hitting better than anyone on the team not named Geoff Jenkins, it would appear likely that my dream subs for '06 of Hall and Hart (able to play any position except P & C!) will never come to be. I suppose it is possible a star 3B could be acquired for Overbay, but it's tough to imagine Hall not being proclaimed the everyday 3B for 2006 soon. One thought that many have put forth the past day or two is Hall being the everyday 2B in a couple years, when Ryan Braun makes it through his fast track in the minors, with Weeks moving to the OF. Or, given that Braun is often talked of moving to LF/RF, maybe Rickie could make the move to 3B. ...at the top of the mythical list would be Hall and Jenkins (you know, it's almost difficult to recall that just a while back, Geoff was struggling). A look at how our government props up the supply of milk by keeping the market price artificially high. As a capitalist, and one who believes in the free market, this sums up my dislike of subsidies perfectly. It's also why I fail to get excited about the price of gasoline. It is a commodity just like any other, and the price is driven by supply and demand on the open market. There's nothing stopping John Doe from buying a shipment of unleaded on the futures market and having it delivered straight to his huge tank in his backyard. In this case, lawmakers have done all they can to raise the price of gas; stopping more refineries from being built for the past score, making dozens of different formulas required by different states (the relaxing of these rules by the EPA after Katrina reduced a gallon by 25 cents in a short time), and in the case of WI, actually have a minimum mark-up, which "protects" us from the evil, giant oil corporations by having all of us pay more every single time we fill up. Interview with Rick Scheslinger can be read here. I've always liked reading waht Rick has to say, as his BS quotient seems pretty low. He worked for the men who are now running the DC MLB franchise and The Gap, so he is likely a smart guy who picked up by osmosis. Turnbow's mechanics seem to have left him in the blink of an eye. Just...like...that. The day Derrick loses Mike Maddux as his pitching coach, I shudder at the mere thought of the inevitable "return to the norm". I might have missed something, but is Durrington needed to play in the field? I can't believe he was the best option versus a RHP (though he does hit lefties) with the bases full in the 8th. Don't look now, but Jose Capellan is suddenly Turnbow to the 2nd power. He'll be handed a spot in the '06 bullpen, and deservedly so. Young, cheap, and his last three pitches were 97, 96, and 96. Geesh. I forgot to throw in a mention that Kane Davis, who throws 95+, has been released a dozen times on most mesage boards, and is twice the pitcher Eveland is, at least at this second. I am quickly losing all faith in casual fans scouting ability. From those who say Tony Gwynn Jr. is a below average defender and not very fast (what?) to those arguing heatedly a few months ago that Geoff Jenkins should be DFA'd and we have to eat that contract, whatever the cost, I'm beginning to think that they are too wrapped up in emotion and like to do much more than throw ideas at a wall and hope one sticks. Don't get me wrong, Eveland is a fine young pitching prospect, but this implosion should have been expected, as I noticed weeks ago Dana's secondary stats weren't an iota better than DLR's. With rare exception, Yost has handled his 'pen superbly, giving his guys defined roles and setting them up for success expertly. There have been hardly any odd "why is he in the game" moments, so it is obvious Ned has an idea, and he's had to change his alignment due to injury several times. However, pretending Eveland has been effective when he has not is far from Ned's best call. 1. The Reds bullpen has a ton of arms out there, now up to 11 relievers. 2. For the most part, they've been very bad. I have to wonder if the two things aren't related. With a good rotation, it's tough to get more than 5 relievers consistent work. There isn't a rotation poor enough to justify keeping a double digit quantity number out there to have to try and get work for. Meanwhile, Dana Eveland needs to read a book. Walking two guys while up three is inexcusable. He is either tired or not very bright. I don't think there's ever been a pitcher with a 5ish ERA who has fooled people into thinking he's been effective like Dana has. As I've pointed out before, DLR has better numbers, and is buried, despite nearly unlimited future possibilities. I've said it before, but there's no way any Brewers' IF is ever going to win a Gold Glove until they replace the official scorer. In the 1st inning tonight, the leadoff man hit a soft liner to Rickie Weeks. Weeks played it nicely, got in front of the ball, but the short hop was too tough, and he was unable to get the out. Error. In SL, Scott Rolen lets a ball slightly off to his side go right past him...hit. I'm the first to say Weeks is far from a good defender at this point, but punishing him for not making a fine play is ridiculous. (9/26/2005 05:32:00 PM) - Robert R.
It took five whole episodes, almost half a season, but I can finally say that I think Rome has moved from "promising" to actually good. Probably because they've finally got around to fleshing out characters and having them drive the plot. Marc Antony finally showing some ambition and independence instead of being just a horny boorish lackey to Caesar. Attia being completely clueless to her son's attributes, taking pride when she thinks he's seduced Caesar and trying to "turn him into a man". Pullo and Octavian being teacher and student. It's a pairing that works. Octavian's observation that he'd "rather not be a swordsman than be a mediocre swordsman. There are lots of dead mediocre swordsman." (paraphrased) was funny and spot on. Attia's scheme to break up Servilla and Caesar, as much out of petty jealousy as strategy, and Caesar's very public embarrassment were well done. Vorenus having to crawl back to Antony and make a vow that you know he'll live to regret. Caesar finally suffering a setback in his battle with Pompey. It's been one-sided so far so a setback makes good dramatic sense. And, probably most of all, Pullo and Octavian teaming up to determine what's been going on between Vorenus's wife and brother-in-law in a surprisingly bloodthirsty and brutal fashion. It's probably also ironic that perhaps the character with seemingly the least going on in the brains department is the only one that can clearly see Octavian for what he is. Forget comparison's to I, Claudius. Rome isn't going to make that leap. But it's finally shown the ability to surprise and has finally fleshed out enough characters to justify the large ensemble. The only thing that's true about what the press reported at the Superdome is that it was ruined in a few days by vandals. The rest was as fictional as a Dan Rather "special report". 10,000 dead was off by what, 9900? My cocker spaniel was only off by 100, and he can't even talk. Baseball Tonight discussed the Crew Saturday night, but my internet connection was out. A quick mention that they had the same record as 1st place San Diego, talked about the young talent, and also that it was likely a coach or two would be let go. I'm telling you, when even the ESPN gang hears the news, it's a FACT!! As for the coaches, rumor has it that Frank Kremblas will be given a job with the big league team next year. I know nothing about Kremblas except that he's a chronic complainer to the media about his own team. Supposedly, he's desired as a bridge to the youngsters, as he has worked with many, if not all, at one time in the past few years. And I suppose it is always worth a mention...neither Robin Yount and Paul Molitor are on major league staffs at the moment, and both were teammates of Ned Yost. Personally, I'm a bit shocked neither of them have even been mentioned for ages. So the United Food And Commercial Workers (UFCW) has decided to shame the giant into complying. They've organized a picket at a Wal-Mart in Las Vegas. But protesting, especially in Vegas, is hard work. It's hot -- often over 100 degrees. The days are long, the sun beats down brutally, and traffic fumes are vile. So the union did what so many other businesses do -- they outsourced the picketing. You can read the entire sweet smell of irony here. How dare they do what we do? Well, don't do as I do, do as I say! Unions are less powerful than ever because of leadership (or lack thereof) like that. Shouldn't someone tell ABC that the idea of a female president being unique or strange is about 30 years behind the times? They are promoting this Geena Davis show as if she's a talking horse. Doesn't almost everyone expect Hillary Clinton to be the Dem nominee in '08? Why are they pretending this is a big deal? Is this an example of the East/West Coast execs thinking that "flyover country" folks are that far behind the curve? Always ironic when guys like Glover and Lehr, "guys who should be DFA'd" according to some pitch well (and I am aware that Glover was DFA'd once), while Eveland and Turnbow struggle. All that matters is who scored more runs, all the rest is for the lawyers. I must admit, however, that Dana's campaign has to be one of the most overrated that I've ever witnessed. Folks are acting as if he's a lock for either the rotation or bullpen in '06, and I look at his numbers, worse than DLR's mind you, and see a youngster who needs to go to Nashville and work his way back. Once again, the team arrives at .500, though they've been here many times before and lost. Considering SL hasn't lost 4 in a row all season, that seems likely to occur tomorrow as well. I feel as if I'm missing something by not being incredibly concerned about a break-even finish, but I hope to see games that we don't have to pretend are meaningful soon. 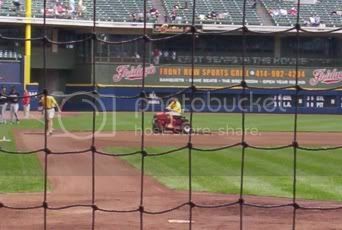 Hat tip to Eric, a regualr contributor, the Crew signs an extension with Johnson Controls to run the inner workings of Miller Park. The tentative 2006 Brewers' schedule. In a word, horrific. After the first weekend in July, the Crew has two weekend series at home the rest of the Summer...atrocious. My cocker spaniel could have done a better job. SF does visit in early May, if Barry would not have returned this month, it would have been perfect timing. (9/24/2005 04:22:00 PM) - Robert R.
A bit of perspective post. While it's true that Rickie Weeks hasn't exactly set the world on fire lately, second base is a position where relatively modest offensive achievements are still meaningful. According to Baseball Prospectus, here are the NL Rookie Position Leaders by VORP. 14. J. J. Hardy 10.9 (with probably a VORP around 16 from late May to present). There's no doubt that Rickie is still a work in progress at the plate and, even more so, in the field. He's still one of the most promising rookies in baseball though and that shouldn't be forgotten. Since Katrina, Stevens has been in newspapers across the country where he was quoted in an Associated Press story as saying the Yakuza Mafia used a Russian-made electromagnetic generator to cause Hurricane Katrina in a bid to avenge the atomic bomb attack on Hiroshima. Um, yeah. Read the whole article here, and bring your chuckles and ability to shake your head. I don't think Mr. Stevens has been abstaining from the adult punch, my friends. 4 day school weeks to save 20% of your transportation costs? The Brewers' site has 2006 schedule info, and it sounds to me like the Crew didn't get any favors as they have the past couple seasons. Only two Cubs series, though one is 4 games, and while 3 AL Central teams visit, the White Sox are not one of them. Compared to 13 midweek games against the Cubs and Yankees, the Indians and Tigers won't set the turnstiles on fire, to say the least. 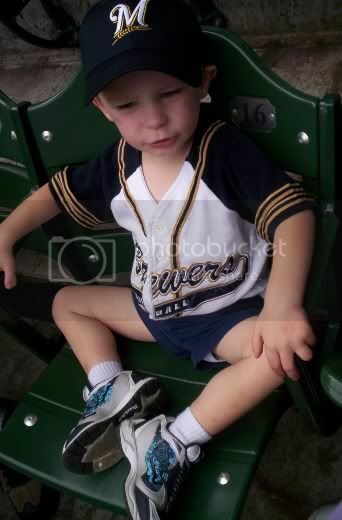 Hopefully, the Brewers will have a large season ticket drive this offseason to make up for the lack of marquee games. One thing I'm excited about is if Barry Bonds and the Giants will visit in April, when Barry will be likely to hit his 715th HR. So I gte into the car after work tonight, and learn the score is 6-6 in the bottom of the 6th...and both starting pitchers are still in the game!!! I think both managers may have been guilty of a bit of non-related nepotism, as both wanted their SP to get the win they probably let that get in the way of sound judgement. Bill Hall making a serious run at either the 2006 3B job or having enough trade interest and value to make it impossible for Doug Melvin to pencil him in as a utility guy. To make myself clear, if Doug sees Bill as a reserve, yet another team sees him as a starting SS, they will probably offer the Crew enough for Bill to make the Brewers better if they deal him. I see Hall as a guy who could be an above average SS, so it's difficult for me to get excited about him as a below average 3B. However, as I often say, Melvin knows best. To add to Robert's thought, I just heard that Galveston was the most populous city in Texas back before the hurricane hit, and it is by far the most deadly natural disaster in US history. And on a related note, I've said it before, and I'll say it again, as soon as I see some idiot reporter standing out in the elements, I lose all respect for them. It's just embarassing. (9/23/2005 09:42:00 PM) - Robert R.
It's been coming up a bit lately, but in case you haven't read the book Isaac's Storm there's probably no timelier set of circumstances to pick it up. The book details a hurricane that hit the booming city of Galveston in 1900, the devastation and deaths caused by the storms, and how the city never really recovered to its former growth curve. It's a good and informative read. While you've already pointed out that OKC isn't exactly regional with respect to New Orleans, it was the smartest financial decision the Hornets could've made. Oklahoma offered what no other city could: a brand-new, NBA-caliber arena with open dates for every scheduled Hornets home game. Throw in a guarantee to top last year's profits by at least $10 million and no other city was really an option any more. Oklahoma City built the Ford Center with the intention of eventually getting an NBA or NHL franchise. As soon as it appeared that the Hornets might not be able to play in New Orleans, they pounced. During negotiations, city leaders made it publicly known that they are making a business decision, not just opening up their arms to some homeless basketball team as a humanitarian effort. There were few concessions to the people of Louisiana. OKC demanded and recieved the vast majority of the home games, all 29 NBA teams playing in OKC (denying Baton Rouge a Shaq-homecoming game), changing the name to the New Orleans/Oklahoma City Hornets and putting an Oklahoma City patch on the uniforms for all home and away games. Officials are already (anonymously) telling the press that the Hornets will never leave OKC. As they had the lowest attendance in the league last year, the Hornets are not going to be in any hurry to go back to New Orleans. Oklahoma should support this team well. They had hoped to sell 2,000 season tickets by the end of the weekend. They had exceeded that amount within 12 hours of the official announcement. Thanks for the note, David, and if this is step one of a franchise move, it makes a lot more sense to me. Considering the painfully poor city government New Orleans seems to be saddled with, it would not surprise me at all if they lose both the Saints and Hornets, as I doubt they will get either venue up and running without corruption and delay. Oklahoma has long supported college sports extremely well, so it wouldn't surprise me at all to see OKC embrace the team. Add to it the way they went about it properly (building the arena, then goiong after a team), they may be the epitome of what a city needs to do to go mainstream. Ned was being questioned as to why he wasn't removing Rickie Weeks for defense late in the games. I would not do it either, unless the Crew thinks it will hinder his development by making a couple costly errors. Rickie's zone rating is .728, which means out of 100 balls hit into his "zone", he gets an out about 73 times. The next lowest 2B with many inings is Jose Castillo of PIT, who has a .766, so despite Weeks' athleticism and range, he just doesn't get to nearly enough balls to make up for his errors. Also, he may be hurt some by the extreme shifts the IF does, as I'm not sure if they make any adjustments based on where the fielder lines up. But, Rickie simply misses routine plays, and often takes strange routes to balls. At the moment, he isn't a mediocre 2B, but there's little doubt he could be very good someday. If a change needs to be made, there seems to be no question he could play any OF spot easily, I'd even throw 3B out there as well, as he has the arm for it, and it's more of a reaction spot. I'm pleasantly happy with what I've seen, as no one expected a polished defensive whiz. Time will tell. If another 2B is sitting in AAA looking ready to go, it'll be time to think about it. Until then, we'll take our chances. I just wanted to reply to your messages and let you know why they are moving to Oklahoma City and not Las Vegas. 1. Money- The lease would provide financial support for the Hornets should their revenue drop. If the team does not earn five per cent more in local revenue than it made in New Orleans last season, taxpayers and local businessmen must pay the team as much as $10 million. 2. Location- Travel wise Oklahoma City is not as far for teams to divert from the original schedule. Plus their division opponents ( Dallas, San Antonio and Houston) won't have to trek far to play games there. 3. Money-Their lease is rent free and they don't have to pay game day expenses while not having to try to bring in money. 4. Location- They were doing terrible in NO and Kansas City is building a state of the art arena. This allows the Hornets to test an untapped NBA basketball market that stretches from Dallas to Minnesota and from Denver to Memphis. 5. Money-No other city offered as much to the Hornets and why would anyone. Plus the Vegas casinos would have give up the gambling on games and I don't know if they are ready to do this without any guarntees. I know you don't follow the NBA as close as baseball, but this really was a no brainer for the Hornets and the NBA for a temporary situation. Thanks for writing and reading, John. All the reasons listed above make perfect sense, especially the location issue for travel, which I assume is important becuase they did not want to change the schedule. One thought, while the sportsbooks would have to stop taking bets on Hornets games, I can't believe that would make much of an impact. My feeling was, and remains, that this was a perfect opportunity to have a one year trial in a city that many feel would be a fine choice, without a long-term commitment. Could the schedule have been redone with little affect, making travel less of a headache, and to fit the open dates available at the UNLV arena? I think it could have, and should have. The much criticized Kane Davis, after two respectable innings today, now has an ERA of 3.14, after dominating AAA for the first four months of the campaign. With a relatively strong minor league system, I doubt he'll make the 40 man roster, but it would not surprise or disappoint me if he did. The main problem with a vet like Davis is if he doesn't make the team next March, you wasted a 40 man roster spot, as he will surely take his free agency and sign with the team with the weakest relief corps. With the success of Turnbow, you can bet many GM's have told their scouts to "find me a pitcher like that, an underachieving vet who throws 95+". Many folks will find it surprising, but if Davis is not placed on the 40, he'll be one of the most sought after minor league free agents this offseason, likely to garner a high 5, or maybe even a 6 figure signing bonus. Best case scenario, Kane agrees to a minor league deal with the Crew, with some sort of "release clause", which agrees to let him go if still in AAA come May/June. starting to sound like a paid agent of their tourism bureau. Mike, one of my more frequent e-mailers, checks in. Thanks for reading and writing. I thought I had read OKC was about 5-6 hours from NO, so I just checked on Mapquest...it's an estimated 11 hour drive, 728 miles. I don't think even the most diehard Hornets fans are making that trip, at least not more than once or twice. Considering the cheap flights casinos subsidize, I don't think it's much of a stretch to say you can fly to Vegas round trip cheaper and faster than you can drive to Oklahoma City. As long as the games were televised back to the Big Easy, I feel Vegas was a choice so obvious I am stunned other cities were even considered. Nice post, Jason, and timely as well. I rarely watch the network evening news, unless I am working and happen to take a dinner break when it's on. Listening to Dan Rather's fictional view of current events keeps me from taking it seriously at all. However, I do enjoy Dateline and shows like that, especially John Stossel on 20/20 and other ABC programs. I turned on the TV for a minute or two this morning right before work, and the cable channel I had on had live coverage of a news briefing from Houston, as a gent was going over a chart and explaining the best evacuation routes to take. I couldn't help but think back to the days before Katrina hit New Orleans, and the deer-in-the-headlights, no clue at all look on the face of the mayor, as he proudly said he was opening the Superdome, minus food, water, generator power, and police protection, of course. It's been pointed out by a few pundits that Rita will not devastate anything (compared to New Orleans) due to the fact no city in its path is below sea level and surrounded by water. I've also noticed there seems to be more mention of the oil refineries off the coast than of the danger the citizens are in. Without a doubt, Rick Helling will get a guaranteed contract from someone in 2006. Doug Melvin was 100% correct earlier this year when he wondered aloud why no pitching poor teams had inquired about him. Rick could well earn about $2M from someone next year, although you have to wonder if the money means much to him anymore. I would have no problem signing him for '06 tomorrow, as the Crew is at a point where results mean more than anything. His AAA stats are likely more indicative of his season long numbers, but I can't imagine finding a better long reliever for depth in the rotation. With any hope, Helling is happy enough to sign for about half of what he'd get on the open market...after all, it's only money. Considering each team will receive an influx of about $15M from the eventual Nationals' sale, locking up Helling for $1-1.5M might be a huge bargain. (9/22/2005 03:45:00 PM) - Robert R.
Not much to say about today's game. Greg Maddux looked like the Maddux of about 10 years ago and completely dominated the Brewers. It's a prime example of what good can happen when you throw balls with movement in the strikezone. One can only hope Jorge De La Rosa was paying attention. Bill and Daron seemed a bit clueless in the 9th when Dusty brought in Ryan Dempster. It's obvious to me that Dusty was managing for Maddux to get to 15 wins and since he knew Maddux will probably have to pitch on short rest in order to do so, he saved him a few pitches. Too bad for Cubs fans that Dusty didn't figure that out in the NLCS a few years back when Prior had a big lead. On a positive note, Rick Helling continued his renaissance in Milwaukee with a solid outing, followed up by Kane Davis and Jose Capellan. I think it's completely in Helling's court if he'll be back in 2006, but a role in the bullpen and as 6th or 7th starter would seem to be a good fit. It wouldn't surprise me though if Helling parlays his September into a 5th starter job for someone like the Royals, Reds, or Devil Rays. Those who don't think the mainstream media does their best to 'set the agenda' in this country obviously haven't been watching TV over the past week and a half. Granted, the coverage of the hurricanes is warranted, and I have no problems with some stories going 'in-depth' on the relief efforts, since its crucial that we learn from the mistakes of what went on during the days after Katrina hit...especially since there is what looks to be an equally powerful storm on its way by the weekend. However, isnt it interesting that we are hearing virtually NOTHING about ANYTHING else major going on in this country right now? I'd bet that if you asked 100 regular people on the street, no more than 20 of them would know that the Senate Judiciary Committee is voting today on the confirmation of John Roberts as Chief Justice of the Supreme Court. Other than respond to a terrorist attack, George Bush will do nothing more important in his presidential term than nominate Supreme Court justices...yet, other than one day of coverage for his hearing, John Roberts has gotten little coverage in the mainstream press...and he is on the cusp of being confirmed to the highest, most important non-voted upon office in the United States. Out of curiousity, I watched NBC Nightly News last night just to see the stories that they covered. All but 30 seconds of their half-hour newscast was devoted to the hurricanes. Like I said, the hurricanes and their aftermath is something that needs to be reported on, and in depth. But if the mainstream press really fails to see how they are losing all their viewers to 'alternative media' (cable news, talk radio, blogs, etc.) they need to look only at what their newscasts have looked like over the past few days to figure out why. I got to see the last couple innings of the Brewers/Cubs game tonight. Not a thing of beauty, but still fun to watch. Derek Lee (I think he spells his name oddly, but who cares really) made two horrible baserunning blunders in the 9th, one in which he ran and was almost doubled off, and failing to advance on the throw to the plate. Very few "name" players tend to be real solid at all aspects of the game. Nelson Cruz sure looks like a ballplayer. I don't have real high hopes for the 26 year-old Cruz, who had a good season at AA and AAA, but not as good as the 23 year-old Corey Hart. I felt Cirillo would be back before tonight, and I haven't changed my mind. As a cheap reserve 3B/2B/1B, you could do a lot worse than Jeff. My wife watched the flight with wheel trouble land tonight. My son asked to stay up late because he wanted to "keep watching the airplane movie". The NBA chooses to have the New Orleans Hornets play in...Oklahoma City? The NBA has always been a forward thinking, progressive league, as shown by its placement of a future all-star game in Las Vegas. It's a shame they went with a regional choice rather than the entertainment capital of the world. I have little doubt that the arena UNLV plays at didn't have 35-41 available dates. Last night's game was pretty much an advertisement for how easy the game is when you score first and get solid starting pitching. I was curious why Turnbow wasn't given an inning of mop-up work Sunday, but Derrick doesn't seem to suffer from not working like a normal reliever. Odd to see that much less than a full house. I wonder if many fans of both teams thought the game was sold out, or if the "premium" ticket prices kept some away. While the marketing team of the Crew is much improved, the TV team should have been plugging the available seats on every broadcast the past couple weeks. The Crew announced Gary Glover will get two starts as the #5 guy the rest of the way, and the JS points out he started as the 5th starter, and will finish as the 5th starter. I like Glover better than most, he pitched decently in the rotation for the most part, but had an awful start or two that skewed his numbers. He and Kane Davis will be among the "elite" of the older minor league free agents this offseason, and I'd love to see the Crew keep both of them. But, unless they are given a spot on the 40 man, I'd expect both to look elsewhere. No offense to the Royals, but Glover would have been a huge improvement in their rotation in '05. Robert is correct, talk radio doesn't affect me. While I might listen to a political or investment call-in radio show, in no way do I consider sports talk radio an option. If I want to hear idiots discuss sports, I'll start hanging out at college bars. So, at 7 tonight, I revved up the TV, asked the spouse to start taping ESPN's poker, and signed onto my poker site of choice, and when the ad ended...the Crew was up 3-0 in the 2nd. I guess they've went to a 6:30 game time the rest of the year. (9/20/2005 03:21:00 PM) - Robert R.
While I understand Al's indifference to the Cubs series and the Brewers' quest for a non-losing season, and I agree that the Brewers' pythagorean record is probably more indicative of their chances in 2006, I think Al lives too far north to appreciate the true benefits of the battle for 3rd in the NL Central. If the Brewers finish 3rd there will be an endless stream of Cubs bashing coming from Chicago sports talk radio which will be endlessly entertaining over the offseason. It's rare to find comedy like that. Regardless of the benefits, you have to like the chances of the Brewers taking two out of three with Davis, Ohka, and Helling pitching. Certainly, Davis has had hard luck in run support and Ohka has struggled some at Miller Park, but they've all pitched well lately. I hadn't even noticed that the Cubs were in town. Should be 3 good crowds on hand. Remember to shake your head at the casuals who wonder why there are so many Cubs fans in the house. For those who care, there are 50% Cubs' fans at Busch Stadium in St. Loius when they play as well, also a sizable contingent in Cincy. They travel well, and the Cubs tend to have a lot of followers that live in other areas, or have supprted the team from afar. I went to a game last year at Miller Park with the Cubs in town, and it was as well mannered a crowd as I've ever witnessed. I did not eat before the game, so I stood in line a couple times, and the Cubs' supporters were friendly. An older couple talked to me before the game, asking which team I was rooting for and how nice Miller Park was. Any illusion of dislike stems from people who would rather see 25K in the park rather than 35-40K. How silly. Why are gas prices set at 9/10th's of a cent? I assume for the same reasons most prices end in .99, but some theories are here. The most popular mix at the moment: the puggle, a cross between a pug and a beagle. "We can't keep them in the store," said Kelly Riley, manager of Puppy World on S. 27th St. and W. Layton Ave. The JS checks in with a long story about how folks are spending a fortune on designer puppies, because many people are buffoons. The idea any sensible person would get a dog anywhere than from a shelter is mindnumbingly ignorant. Being one who believes in the power of capitalism, I'm not for banning puppy farms, I just wish they'd have no one to sell overpriced, soon to be unwanted dogs to. One of the news items of the day is some questioning whether or not NASA be allowed to continue to fly. I feel anyone who fails to see the benefits of space flight is being short-sighted. Science, and the quest for knowledge, should be something the government strives for. That said, the idea of going back to the moon is a bit of a yawner. I'd say NASA needs some marketing people to explain to the geeks that we've already been there, and didn't really find a whole lot. (9/18/2005 11:30:00 PM) - Robert R.
We're 1/3rd through with the season with the 4th episode of HBO's ROME and we finally get a bit of character exploration of Caesar, you know, one of the focal points of the series. About time. Not much plot this time around, but the series was in dire need of fleshing out some characters and this was a much needed episode. Highlights include Atia trying to turn Octavian more into a man by feeding him goat balls, a funny look at the ancient art of bribery which I suspect hasn't changed much over the years, and a crudely humorous take on how an ancient rumor got started. Still, this series is lacking something that solid acting and well above average production values can't quite hide. Compelling, fleshed out characters is probably the biggest weakness of the show. It's particularly notable during the "everyman" segments featuring Lucius Vorenus and Titus Pullo. The two are really only interesting as an odd couple pairing. Alone, Vorenus is too dour and earnest to be entertaining and Pullo is too much of an irresponsible clown to care about. Both characters need to show more dimensions. The upper levels of power are more interesting at the moment, even if only barely. I've said it before, but the young Octavian is the standout character to me, whether eating goat balls to please his mother, to bonding with his sister, to quickly analyzing the strategies of the political maneuvering, and being a bit patronized because of his age, he's easily the most fleshed out character of the series. The same sort of attention is needed for other characters since I don't sense Octavian is going to become the focal point of the series anytime soon. This post is in response to this post, as many people did not think they could buy a shed for $10,000. A nice little home for $9K. Looks better than I would have guessed. MLS # 212520. And if you're willing to splurge, here's a model for $11K. MLS #214673. The link I provided does not seem to allow for a direct route, so I have also listed the MLS number, so you can type it in for a picture and description, if you so desire. Or, if you have a favorite realtor's site, I assume you can type them in there as well. They aren't big, but they do look better than many houses in the Eau Claire "campus ghetto" area. :) Again, my point is not that it is easy to own a second home (it's tough enough to pay one mortgage), but it is not unrealistic to say that most anyone could afford a second home, if they so desired. We happen to live near the top of a large hill, granted, the Wisconsin River is at the bottom of the hill, a couple miles away, but if our cul-de-sac ever floods, I believe the world may have ended. I didn't dig a whole lot, as the two cheap residences I found are both in an area that was hit by the big flood in that state a few years back, so they may well not be the best choices if you are buying a 2nd home to "ride out a disaster". That said, it is a viable option. The road to 81 wins got a lot tougher, huh? I have not concerned myself much with the .500 mark as a goal, as to me it matters little if a team wins 78 or 83 games, both are nowhere near the actual goal of a 90 win season, which means playoff contention. I took a break today at work and while enjoying some of the health cookies in the vending machine, watched the 2 minute drill in the Packers game. I always find it enjoyable when folks criticize the "prevent defense", which is for all intents and purposes just a soft, deep zone. On the one hand, when the Browns clinched the win, you saw exactly what can happen if a team is playing a normal, or aggressive defense, the opponent can hit one pass and score a touchdown just like that. On the other hand, you can force your opponent to hit about a dozen passes, execute all the way, hang onto the ball, and score in that manner. I have heard from many of you that don't think you can buy a shack for $10K. I hear ya. For many of you, where you live, you cannot. Remember, I specifically stated you would have to look in a rural small town. You're not going to find one in the burbs or in a Southern hotspot like Nevada, Florida, or Arizona. I do know for a fact that there are decent, small, older homes in my hometown currently selling in the $30K range, and it's not that far off the beaten path (about an hour from Madison). You have to dig, to be sure, and unless you work at home, you're not going to be able to commute. If I have time in the next couple days, I'll hunt a bit. If you are aware of a cheap home, let me know as well. Ben Stein should be required reading and studying for all high school students. He simply makes so much sense when he speaks it is scary. Today he suggested that anyone who lives in a region prone to disaster (along a coast, near a fault, etc.) should make a 2nd home part of their emergency plan, along with cash, a car, and the proper amount of insurance. He was picked on a bit, as the panel said many folks did not have the money for a second home, but to be honest, investment shows aren't watched by many of those living check to check. Heck, many do not bother with insurance, as they "can't afford it". As with most things, I think many people simply overestimate how much a second home costs. There are many areas in the US where you can buy a "fixer upper" for $10K or so. No, this won't get you into the Hamptons, but it will get you a roof and four walls in rural, small town USA. Considering $10K can be earned in 20 hours a week at a beginners level, low paying 2nd job in 71 weeks, almost any couple could pick up a job on weekends or in the evenings and earn enough to buy an older, beat-up home in less than a year (or if you are single, 2 years). It's really just like the accepted strategy for buying a house to live in, you buy the most house you can afford. Even if you can barely scrape the payment together at first, in theory, you will earn more as time goes on, and if real estate appreciates at 7% in the time you live there, the more you spend, the more you'll make. Doesn't look like tonight will be a "heartbreaker" or a "disaster", as the Astros lead 7-0 after 6. The Crew's AAA team won the PCL title last night, as their one remaining high prospect there, OF Nelson Cruz, hit a 3-run HR in extras to win it. I would assume a player or two, as well as a pitcher or two, would be brought to MIL. If the team was in a playoff race, you'd probably also see Durrington and a C added for flexibility purrposes, but due to 40 man considerations, that seems doubtful. Cruz and maybe Krynzel; and an arm for the bullpen would be my guess. UPDATE: Cruz and Durrington (no mention of his status on the 40, aka, someone else being removed), and Gary Glover (who was for sure NOT on the 40) brought up. Gary will not join the team until later, as he pitched last night. I’ve enjoyed your site for years. Even though I currently live in Illinois, I try to keep up on the Brewers as much as I can (Extra Innings on Direct TV, XM radio, internet). I’m most proud of the fact that I have a 20-game season ticket package, and make many trips to Miller Park. I heard Lyle Overbay on “The V show” on ESPN Radio early this morning. I came in after the interview was under way, but I got the feeling that he was a semi-regular guest in this show. Among other things, Lyle seemed to indicate that he will be traded in the offseason (not anything we didn’t already know, but he spoke fairly candidly about it). I’ll try to paraphrase what he said. ---Oswalt has recently added a fifth pitch—a splitter that Clemens probably taught him. In the at-bat before his 6th inning HR, Oswalt jammed him with this splitter. In the 6th inning, he tried it again and this is when Lyle pulled it for the HR. ---Lyle personally feels that Prince Fielder is ready right now to play everyday in the majors. ---In regards to next year: Lyle said there wasn’t room for both he and Fielder, that you’d have to trade one of them. Since Prince will be making the minimum next year, and Lyle is set for a raise (because he is arby eligible) it would make sense to trade Lyle and use that difference in salary to get a fifth starter or major league role player. ---Lyle would love to stay in Milwaukee, he loves the team, loves the city, and loves the fans. It is a great place to play, and it is disappointing that he would have to leave right when the team is on the cusp of becoming very good. ---Rickie Weeks is injured and not the same player he was when he was first called up. I've felt the same way about Weeks for the past couple weeks. I do like his toughness, however, as it deems well for his future as a 2B. Lastly, I've noticed the past couple one-run defeats that the guys who have little chance of being here next season (Overbay, Helms, Magruder) often seem to be devastated over the loss. I'm not sure what to make of that exactly, but this seems a good place to throw it out there. Michelle Malkin, asking the head of the Sierra Club why they sent a gas guzzling SUV to pick up a speaker who then made an anti-SUV speech. Curious, I asked Antebi whether any of the staff at the Sierra Club headquarters owned and drove SUVs. He stumbled and said the group didn't keep track of who drove what. It's "a personal decision," he explained. "People drive different cars for different reasons." Well, um, exactly. Now, wouldn't it be nice if these anti-SUV green busybodies took the same attitude towards the rest of us and left our car choices alone?! The sole purpose in the life of some is to keep you from doing what you want to do, but for them to be able to do whatever they want. I can't believe they get anymore media coverage than those who dress up dogs or worship rocks. The JS calls it a "gamble", going with Dana Eveland that is, rather than going with Lehr or Kane Davis, or even bringing in Turnbow. Both Lehr and Davis have done fine, of course, especially considering they were AAA depth most of the year. Neither is lights out, but both have compiled a 3-3.5ish ERA, serviceable middle relivers, at the very least. Back to this discussion, I wouldn't have brought in Turnbow either, as Derrick has done all he can to prove he is not capable of going more than an inning effectively. On the road, this is realy a no brainer, as you still can use your closer as you normally would, in a save situation. Can you imagine the outcry if Turnbow would have been used to retire Bagwell, and then in the 10th, then after the Crew scores a run in the 11th, 12th, or 13th; the reliever called upon for the save serves up a 2 run HR to lose? The humanity!! Eveland actually pitched well, as the game-winning hit was the first well struck ball, the first couple hits were just ground balls that went through a hole in the IF. As I point out consistently, when a game comes down to a one-run ending, a bloop hit takes on mammoth importance, and no one goes up there trying to hit a blooper over the SS. Such is the breaks of the game. To be honest, as well as Oswalt and Lidge pitched, the Crew was lucky to get to the bottom of the 9th. In the game this evening, with Roy Oswalt on 1B, Craig Biggio singled to CF. Brady Clark came up throwing, as Oswalt was trying for 3B. He made a decent throw, but it was not in time (Cirillo let it go to Helling, who was backing up, as it was "behind" a sliding Oswalt, not risking a diving stop. This made no difference in the play, however.) for Oswalt, who runs very fast for a pitcher. On the throw, Biggio went to 2B. Daron & Bill later said there had been a "bad decision" made on the play...and I still can't figure out who made it. I would assume they were implying Clark should have thrown to 2B, but to me, if you have a chance at the runner, you throw to 3B. It was a low enough throw, it could have been cut off, but Bill Hall chose to let it go, thinking they had a chance at the lead runner. To me, not being a chronic second guesser like our TV team, this is just two cases of aggressive baserunning by HOU. Oswalt might have been thrown out, had the ball been hit a tad harder, or Clark's throw been a tad more accurate. Biggio could have been thrown out had Hall decided to cut the ball off. But, gambles were taken, and in this case, paid off nicely for HOU. Interesting point: after falling to 31-39 on June 21, the Brewers are 42-34 in the games since -- that's the fourth-best record in the NL during that time (STL, HOU, and ATL are the first three ... and they have the best records in the NL, period). This is indeed a hopeful time for us fans. Regular contributor KH with an interesting tidbit. I think Weeks came up just before this "lowpoint", so I think it's safe to say Weeks and Ohka have been more of a help than Spivey. Baseball Prospectus used to be the cutting edge site for us stat minded fans, but it's taken many steps down the past couple years. While its free content is all but nonexistant, they do check in with a Brewers season recap, with some meaty content. They don't mention it, but while Weeks has struggled some in his rookie season, he's almost exactly avergae for a 2B. I'm not sure if this tells you how good he might be, how weak the average 2B is, or both. I'm listening to tonight's game on the radio, though I didn't turn it on until it was 14-0. I don't think I played in many slo-pitch softball games that were more one-sided than that. ---Rickie Weeks just turned 23, and while he has struggled at the plate of late, he continues to make spectacular defensive plays, while booting some routine ones. There is no doubt Weeks could be a top defender someday, as there are few as athletic, and I would say he already possesses one of the best arms in MLB for a 2B. Don't forget, Rickie is playing hurt. While I'm sure pitchers and scouts have found weaknesses, he seems to be behind a lot of fastballs right down the middle...I have to think he's in more pain than he's letting on. Also, Weeks didn't set the Southern League on fire last year either, and then just tore up AAA. ---I would have sent Overbay on Rickie's short fly ball to LF in extras. Luis Gonzalez has one of the worst OF arms in the history of the game; I would have taken the chance. ---With all the talk about how tough it is to find pitching, it's difficult to believe Kane Davis sat at AAA half the year. I know his career numbers are underwhelming, but he throws 95+ consistently, and I have to wonder what his stats are outside of Coors, as he spent a good deal of his big league time there. ---Also, Rick Helling was also at AAA, unwanted, Tomo Ohka was pitching long relief, and Dana Eveland was in AA. Astoundingly, the pitcher with some of the best stuff on the staff remains Jorge DLR. ---Nice to see Jenkins get a game off tonight. Regardless of the quest for .500, I certainly don't think he should be playing until the team is certain he is not risking more than a bad back by playing. Corey Hart should be playing a couple times a week anyway, at the very least, I'd rest Geoff versus lefties and in day games after night games. Amen to that. To be honest, they should do it whether there's a hurricane or not. What's that old saying, a billion dollars here, a billion dollars there, pretty soon, you're talking about real money. So, most every night, I go to whatever poker site I'm currently chasing a bonus at, and then start checking out my favorite sites as I play. I often start with my Sharebuilder account, as I find it fitting to begin my recreation by seeing how much my choices fell that day. However, there are few I'm any more grumpy about than DOW, better known as Dow Chemical. I'm no financial expert, but when a stock is poised to bring home $5.50 a share, it shouldn't be trading anywhere near $40. Glad to hear you are feeling better, Robert. Look forward to reading your thoughts about the 2006 Crew, as well as the last couple weeks of the '05 campaign. Mark A is an absolute genius. Are we ever fortunate he got the team rather than Dan Gilbert. Gilbert has already torn down the Cavs and made LeBron James publicly discuss leaving his hometown team. The seats that remain aren't anything special, but the price sure is right. Get yours within the next hour or so, or they'll be gone. (9/15/2005 06:31:00 PM) - Robert R.
I've been missing for a few days due to a bout with an infection. Everything is cleared up now. I've been back long enough to see the third episode of HBO's ROME. I'm still waiting for magic. Caesar is little more than an ambitious enigma. Pompey is a model of overconfidence. And the rest of the major characters of the period do little more than fulfill their destinies, for the moment. Yet, I'm sensing improvement in the series. The murder of an ex-son-in-law, only ex because of political machinations, gives a little of the kick of the constant plotting and backstabbing of I, CLAUDIUS. And there was some genuine humor in the episode from Titus Pullo giving "women advice" to the cliffhanger with Pullo ending up with most of the treasury of Rome in his hands. If ROME is going to make it into the ranks of a good show, then the history lesson is going to have to be the backdrop not the main story. This was the first episode that managed that trick, even a little. No one finds any suspense in whether Caesar will eventually take over or cares about the legitimate concerns of Republic vs. Empire in this setting in anything other than academic terms. Give us characters that interest us, moral delimmas, heroes to cheer and worry about, villains to hiss, etc. and the backdrop will become compelling. Just storytelling 101. Donald Sensing sees his son off to Iraq. We await his safe return. I've enjoyed your musings all season long, and I'm glad that the Brewers have started to play better. As a subscriber to MLB.tv, I get the chance to hear a lot of other announcers, and none really come close to the amount of camp and pandering that the Brewers TV announcers do (maybe except for the guys on the Mariners). The club must have the perception that all Brewers fans are lowly, homely, mindless middle aged men has got to change, because clearly the majority of people who are watching the game actually understand it. I have many gripes about Sutton, he is way to schmaltzy and often times I feel embarrassed for him when he harps on a subject too long or over emphasizes stupid points ("Why would he NOT have bunted him over to third" moment is fresh in my memory). I think they tried to replace Vasgersian with a Vasgersian wannabe, and it hasn't worked. Schroeder is OK in the color role despite his verbal crutches ("Like I said before" and "Again" are favs of his), I don't mind him at all, just wish he'd just interject that catcher's insight on his own rather than Sutton asking a ridiculously staged question. The worst offender, and I don't think I've read this on your site, is the amount of pandering and bush league that Bob Brainerd brings to the telecast. I seriously cannot stand him when he starts talking, starts doing something stupid, or tries to be oblivious to D&B. Maybe if he were doing an entertainment show for four year olds he would be serviceable, but it's still a baseball game with real strategy and real ballpark stories going around. Even his tone of speaking reeks of talking down to the lowest common denominator viewer, I don't know if he did this when he was a sportscaster in Green Bay, but still, it's disheartening that people statewide are subjected to his idiotic "reports." I just had to chime in on this, maybe it's 144 games of rage built up and it's all being unleashed on you ... but I figure you are the one to most sympathise with it. Thanks for reading and writing, Nate. I do not have the same dislike for Brainerd most do, I can't really think of a lot of "cool" stuff he can do in that role. Maybe it's just me, but the only people who have really had success in that role have been beautiful women...I'll leave it at that. All season long, I kept saying what good pitching depth we had at AAA, and thus far, Rick Helling has a 2.40 ERA (this includes the time he gave up 6 runs without retiring a batter), and Justin Lehr has a 3.08 ERA. Combine this with Capellan, Kane Davis, and Obermueller's decent but unspectacular outings, that's incredible pitching depth...and it doesn't include Ben Hendrickson or Mike Adams, who both struggled in Nashville this past year. Eerily similiar, aren't they? It sure doesn't seem like Dana has allowed that many baserunners, but, I guess he has. Also, it sure isn't difficult to imagine DLR's stats being every bit as good if he would get regular work like Evelnad has. Mike Hunt agrees that the sun rises in the East...I mean, that Overbay will be traded to make room for Prince. Alos, an update on Miller Park replacing the faulty bogies, sounds like it will be done over two winters, rather than one. It looks like the entire organization is in Arizona for the end of the year meetings. I feel it is ironic that the AAA team (albeit, almost completely devoid of prospects) is still in the playoffs, so the coaching staff is not there. Granted, a conference call can easily be worked out, but it seems strange. Just wondering what your take is on all of the pros on the WSOP coverage this year? The one they are showing right now is almost an all star group...Todd Brunson, Johnny World, Cloutier...wow. Nice to see but it's surprising given the huge fields. The pros are still rising to the top. It's a game of skill, so it's not a shock. That said, there are many excellent unknown players, and in some of the smaller events (say 1000 entries), it isn't impossible to get lucky on a few key hands and make the final table. The thing I can't believe is how many times I've read TJ Cloutier is millions in debt, as he wins in poker and loses on sports betting and other table games. Eric points out this article from the WSJ. My son and I watched the 5PM edition of CNBC's Jim Cramer Show this afternoon, as we were rained out of our usual decathlon of backyard activities, including sandbox, swing, golf, basketball, baseball, frisbee, and running down the slide and jumping onto Daddy. Andrew likes Jim, as we call him the "funny guy". Last time we saw some of the show, which for those who are not capitalists, is basically Jim walking around the set for an hour, answering questions on caller's stock picks, wiping his sweaty forehead with a hankie, commenting on every caller's city and excitedly discussing how to make money in the market. Many question his picks, but he's fun to watch. Andrew often asks, "Why is the man yelling? ", to which I tell him he's a funny guy, hence our earlier talk. The only reason I mention it is because Jim's #1 pick of the day was Weyerhaeuser (WY), which has a huge plant about 2 miles from our house. Jim thinks lumber will be in short supply, due to the massive rebuilding on the Gulf Coast (on a related note, this is why I like Lowe's and Home Depot so much right now). The plant down the road usually has about, oh, I'd say 500K logs sitting out in front, so if lumber goes up in value, it's a fine play. On a baseball note, Jim mentioned he got one play from "Nails", who is better known as Lenny Dykstra, former Mets and Phillies OF. Lenny is a very smart man, an overachiever his entire career, who preached and practiced OBP. I know I quoted him a long time ago, as he was swearing about players swinging at the first pitch when they were down 2 in the 9th inning. He or Rickey Henderson would be my perfect idea of a hitting instructor, but if Lenny is into investing his millions, the idea of 12 hour days at the ballpark making a fraction of what you did as a player seems rather ignorant. There have been some discussions of late as to which players have to be protected by the Crew this offseason, by adding them to the 40 man roster. the Crew still has a fine minor league system, though many of the prized prospects have already been added to the 40 man. The consensus among the knowledgeable is the Brewers will have to add 5-8 players, the best being...Tony Gwynn Jr. and Enrique Cruz (yes, that Enrique Cruz, the same one who spent the 2003 season as the 27th man on a 25 man roster. Both these players are bonafide prospects, and it is unlikely either would still be with the organization if they were eligible for the Rule 5 draft. That said, I would project both of them as reserves in the bigs, at least for the majority of their careers. While you hate to lose anyone, if these are the best of the lot, I can't be real concerned about losing guys that aren't as good as they are. I've spent my last few nights "working off" a bonus on Poker Stars, well known for its tough players and conservative play. I always enjoy playing at the site, as the outstanding graphics and perfect, glitch free play often make me forget I'm simply not as good as many players there, and losing. Luckily, the bonus will make up for that. ---Over the weekend, I saw most of the rerun of Comedy Central's Pam Anderson roast. It was as funny as any of the televised roasts I've ever seen, and easily the most risque. The bleep machine ran overtime, often 3-4 times in a one sentence joke. Two people stood out, one being Courtney Love, who without a doubt was under the influence of drugs and/or alcohol. Her behavior, edited together in a continuous loop, should be shown at counselings and interventions. And while Love has had moments when she was a very lovely woman, those days are long gone. The second was Lisa Lampanelli, who is a middle-aged, plain looking gal who is one of the funnier comics working today. She reminds me of Joan Rivers, back about 2.5 decades ago, when Joan was funny, and not just calling every woman who weighs more than 95 pounds fat. Lisa also had her own stand-up special on right after, but it was midnight, so I hit REC on the VCR (ironically, that's the only way we've ever figured out how to record on our upstairs model). ---I am wondering what to think about the lack of casualties in Louisiana, as I believe more deaths have been recorded in Mississippi, which has received a fraction of the media attention. Considering I've seen several reports that computer simulations of hurricanes of that force have led to virtual body counts of 60K, it's getting easy for me to view this as nearly a best case scenario. Heck, hotels are opening, some hard hit suburbs have electricity and aren't that far from "normal", and there is talk of how big Mardi Gras will be in 2006, albeit quietly. My outlook remains that in a decade, New Orleans will be a mostly rebuilt, new city, either with an improved flood control system, or in a different, nearby location. Sure, there will be some historical buildings (those on or near Bourbon Street, which for the most part, is on high enough ground to have not flooded), but for the most part, shiny new. Also, I don't see it remaining a poor city, as new and improved will mean many of the former residents will be priced out of the new city. I also think Biloxi will emerge as a Southern tourism hotbed, as I have to believe the politicians of Mississppi are intelligent enough to end the ban on non-floating casinos, and this will cause that area to rebuild quickly, and better than it used to be. Call me a simple optimist, but I see a bright future along the Gulf Coast. HT article that tries to figure out who pitches well at Coors Field. 1. It is often the best thing to happen to someone to get fired, yet no one ever wants to be in that situation. I happen to be in Manhattan on September 11th, up around 108th and Broadway. The local NYFD crew has been making the rounds of the local watering holes since about noon, raising pints and engaging in general jocular revelry. As of 3PM local time, the mobile wake shows no sign of slowing. They're in uniform, both white shirts (captains) and blue shirts (firefighters), at least two truck companies (NYC runs 6-man trucks). No radios in evidence, so I suspect they're the relief crew, off duty for the day and celebrating the memories of their fallen comrades. Unfortunately, I'm on deadline and have a head cold, or I'd stand them a round--even if I'm a California boy. Decided it would be too nosy to take pictures, since this is between them and their city, but thought you'd want to know. I can promise you this wouldn't be done, at least not in uniform, one year after, so if it's OK for the FDNY to use this day as a day of celebration, it would seem to me to be good for anyone. I will do my annual "pledge" post to the NYPFWCBF now as well. This group was started by Rusty Staub, former Mets player, and gained worldwide acclaim in the days post 9/11, and deservedly so. While this publicity helped the group raise a lot of money, it added a lot of names to the list in the days and weeks thereafter. They give an immediate gift, and then an annual check as well, as long as the spouse lives. If you wish to find out more, you can do so here. I am not one to tell anyone where to make your charitable contributions, but for my money, this is a cause that is beyond reproach. If you choose to give a portion of your income to charity, consider this one. Rick Helling, much like Gary Glover did a year ago, might be pitching well enough in September to earn a 40 man roster spot this offseason. Helling, who sat in AAA despite pitching well and showing good velocity, did not draw any major league interest. Doug Melvin even commented that this was shocking, considering how many teams could have used a 5th starter improvement. I would say that while certainly no better than a mediocre back-of-the-rotation starter, he would fit in nicely with in any bullpen, as a spot starter/long man. He's almost as old as me, but he still throws 90+ (and would throw even harder if he only pitched an inning or two at a time). If he doesn't land a spot on the 40 (which is probably more dependent on how many youngsters have to be protected than how Rick pitches), I would think he'll be one of the more popular minor league free agents on the market this winter. Kane Davis, who has done OK in his stint with the Crew, and was lights out for much of his AAA campaign, is probably in the same boat. As the old saying goes, you can't teach velocity, and it is unlikely there will be more than one or two pitchers available (not named Billy Wagner) that hit 95 on the gun like Davis does almost effortlessly. Minor league guru John Sickels puts up a guess of what Rickie Weeks career will look like after it is all done. While it's a fruitless thing to do, it's an interesting chart. Eric e-mails me the text of the article that mentions that Jarrod Washburn would consider the Brewers. It doesn't seem as if his quote is anything but him saying he'd love to pitch close to home. Jarrod Washburn, who can be a free agent after this season, has made his intentions clear from the start: He wants to re-sign with the Angels. But, that scenario isn't looking as rosy recently for a number of reasons. One being the emergence of Ervin Santana. Another is that the Angels have several young starters like Joe Saunders and Chris Bootcheck with major league experience, and they could bring back Paul Byrd at a cheaper price. A third is that the team will likely spend some money in the off-season to help the offense. If they re-sign other free agents like Bengie Molina or Byrd, there might not be enough money for Washburn to come back to the only team he's ever known. Washburn, who is represented by Scott Boras, has signed three consecutive one-year deals with the Angels and is making $6.5 million. Despite a 7-8 record, he is fifth in the American League with a 3.18 ERA and could command a long-term deal with several other teams. There are rumors that close friend and former Angel Scott Schoeneweis is recruiting him to play in Toronto. Washburn could also sign with the Milwaukee Brewers, so he could play near his residence of Danbury, Wis.
"We have a very important month of baseball left here, and that's all I'll concern myself with right now," Washburn said. "If, at the end of the season, things don't work out and I go elsewhere, Milwaukee is definitely a place I'd consider. Glenn wonders why the media wants to show bodies from the flood, but not 9/11. I could argue it's a general decline in morals, but that seems doubtful. To me, the press seems "disappointed" the initial death count is so low, and thus wants to make the events seem worse than the numbers. You will note that CNN does not seem to care whether or not they will offend, or disrespect, or offend the memory of a loved one. And the amazing thing is, CNN wonders why no one watches them anymore. Seriously. UPDATE: To be truthful, I seem to recall extremely high estimates of 9/11 dead as well, does anyone else recall 20K being guessed? I also think they were still saying 5-10K days later. It is in the best interest of the media to dwell on the negative, as they never report the thousands of flights that land safely each day, just the crashes. Tomo Ohka's performance tonight almost identical to Roger Clemens' last evening. Sadly, that isn't a good thing. We have a very important month of baseball left here, and that's all I'll concern myself with right now. If, at the end of the season, things don't work out and I go elsewhere, Milwaukee is definitely a place I'd consider. I can't get into the article to see if this quote is obviously out of context or not. Whether he ends up taking less to come "home" to MIL or not, it is lovely to see the Brewers mentioned in a place where they usually are not. Certainly nice to win the 1st one against the Astros, as Jim pointed out, the pitching matchup favors HOU in every game. And I'm happy Doug Davis won his 10th game just so they'd stop talking about it on TV. I think they mentioned it 3 times...and I got home when it was in the top of the eighth. (9/09/2005 06:34:00 PM) - Robert R.
I'll be flipping back and forth between the Brewers and the Hurricane Katrina relief concert tonight. A few thoughts on the latter. Rod Stewart is performing in this national concert. At this point in his career, I'm surprised that he can score a gig larger than Potawatomi Casino. He's easily the most surprising choice of the night. Neil Young is the performer that's most likely to do something inspired, ala "Imagine" at the 9/11 concert, or to pick something truly inappropriate. Some of his biggest hits, including "Down by the River", "Like a Hurricane", "Southern Man", "Ohio", "Rockin' in the Free World" and "Be the Rain" are just totally inappropriate. "Helpless" or a cover song would probably be the best choices from Neil Young. Paul Simon's presence pretty clearly spells out to me that "Bridge Over Troubled Water" is the likeliest show closer. It's a bit of a cliche', but it's also totally appropriate. John Stossel speaks for the other side on raising prices. I can't say I agree with John here, but I've always enjoyed his work, and appreciate his viewpoint. While flipping last night, I did catch him on a rerun of a talk show in which he again pushes for the elimination of government issued flood insurance, which basically just pays everyone, regardless of whether they built 10 feet from the ocean, in a flood plain, etc. Mr. Stossel should know, he took the money twice. I really don't have anything to say Brewers related, so once again I'm going to suggest you check out John Strain's weblog. John lives in Covington, LA, a suburb of New Orleans, and his home was spared for the most part, but he brings up other things I hadn't thought about. It's a good read. And out of curiousity, I did a search online for MRE's (meals, ready-to-eat), wondering if you can buy them at camping stores, like Gander Mountain. One of the results was Ebay, and sure as shooting, there are 491 MRE related items for sale tonight at Ebay. Golly. (9/07/2005 11:39:00 PM) - Robert R.
I have a friend in the National Guard who was called up to help out in New Orleans. "Worse than Afghanistan" is her initial view of the situation. Certainly it's not going to be a pleasant experience, especially when dead bodies start to be recovered. I think everybody knows what to expect, but photographs and video still will have an enormous visceral impact. I just updated the sidebar as to JJ's performance since he went back to his old hitting style in late May. At the moment, he is quite a bit above average for a SS, if you look at those stats, but he'll still be a surprise to many in '06. A couple months ago, despite what the braintrust said, there was some doubt as to who would be the SS in 2006. But with Bill Hall returning to his low OBP norm, there seems to be no question that JJ is the starter, and Hall will open 2006 as a utility player, or elsewhere. The Crew closed their Dominican academy a couple years ago, and said they hoped to spend the money (about $500K) they were spending on the academy on top talent. Looks like that is indeed the plan. I just turned it over to the WSOP coverage, and Josh Arieh appears to be well aware of the cameras this year, after making an idiot of himself many times in the main event last year. The Evil Empire looks to have donated the GNP of many small nations, and the Walton Foundation added in another $15M. I can't believe this does much for the stock, but good for them. At the very least, it looks like Wal Mart should be put in charge of the city of New Orleans' disaster planning once they rebuild. 3 unheralded free agents, and one unheralded reliever who was traded for. The more guys you can pick up like this, the more players you can afford, if you are a team whose name doesn't rhyme with Jankees. UPDATE: Almost on cue, by far the most heralded arm of the night takes the loss. The online site I was clearing a bonus at went down tonight, so I sent them an e-mail asking for a reduction in hands needed, and relaxed the evening away, watching the Brewers win and reading yesterday's paper. ---Geoff Jenkins sure is smacking that ball, huh? It hurts my back to watch him run though. I sure seem to see a limp as well, but I wouldn't publicize it either, I guess. ---Dana Eveland picked up his first save, and maybe his last, if he does go back into the rotation next year. ---I wonder how many times the Nationals have felt stupid for giving Tomo Ohka away over a minor disagreement. It really makes Olson's "attitude is all that matters" column look assinine. Heck, the Crew might look to sign him to a 2-3 year deal, if he is willing this offseason, and lock him up for a free agent year or two. DC made the age old mistake of judging a guy by two months rather than several years. The TIMES-PICAYUNE published a story on July 24, 2005 stating: City, state and federal emergency officials are preparing to give a historically blunt message: "In the event of a major hurricane, you're on your own." Staff writer Bruce Nolan reported some 7 weeks before Katrina: "In scripted appearances being recorded now, officials such as Mayor Ray Nagin, local Red Cross Executive Director Kay Wilkins and City Council President Oliver Thomas drive home the word that the city does not have the resources to move out of harm's way an estimated 134,000 people without transportation." Yeah, it's all FEMA's fault. What the US Navy is doing. Movie star and political activist Penn, 45, was in the collapsing city to aid stranded victims of flooding sparked by Hurricane Katrina, but the small boat he was piloting to launch a rescue attempt sprang a leak. Just what the authorities need, a publicity seeker in the midst. When I was flipping channels a bit earlier, CNN had on a gent with a foreign accent who was treated as a bit of a disaster expert. When asked how he thought things were going, he said that on Day 8, some power was back on, they were pumping water out of the city, and clean-up was going full speed ahead. He said from his experience, Day 8 is usually still trying to get food and water to the survivors. Again, the fuzzy memory brigade would have you believe it isn't, but pretty much all signs point to this being a fine effort. After the first few days, dare I say, the word spectacular comes to mind. On the pre-game intro, Bill said (and I'm not kidding), the stats are pretty much the same, the extra wins are because they are doing the little things better. Where I come from, scoring an extra 0.4 runs a game and preventing 0.31 runs a game is quite a difference, and the won/loss mark shows that. It ain't rocket science, it's all about getting baserunners on offense and preventing them on defense.